No. 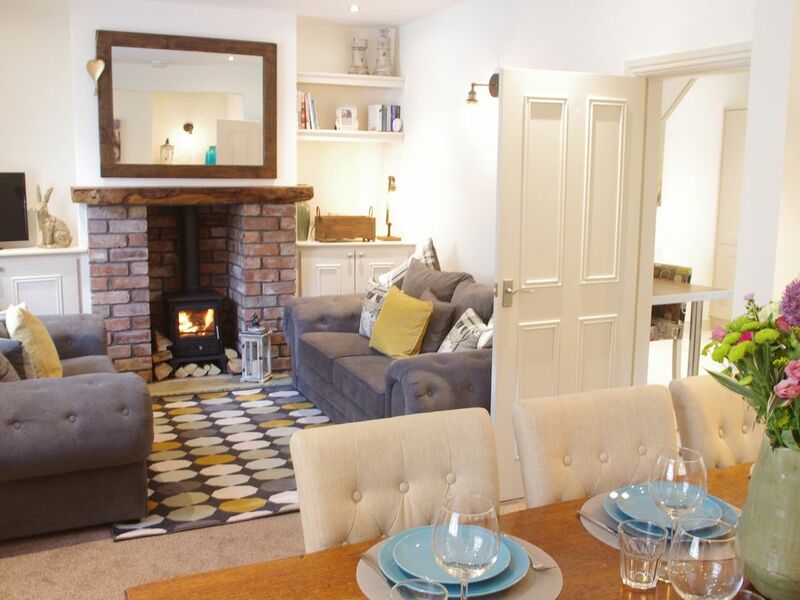 1 Chapel Row is uniquely located on a quiet churchside lane in the heart of the bustling market town of Bakewell, thus combining a traditional market town atmosphere with countryside surroundings and endless recreational possibilities on the doorstep. • Please note that we are dog friendly at No. 1 Chapel Row. We ask that dogs are kept under control at all times and a maximum of two dogs are allowed if pre-arranged. We expect guests to keep dogs out of the bedrooms and off the soft furnishings. We charge £20 per dog for the duration of your stay. Please see our dog policy on our website for more information. Bath and hand towels and fresh linen are provided, with beds made up on arrival. A travel cot is available on request (please bring own cot bedding) and each bedroom has a hairdryer and iPod docking station. There is plenty of space to cater for your group in the light, spacious kitchen. Two people can dine informally at the countertop bar stools, or head outside for the evening sun on the patio. Alternatively the dining room offers comfortable seating for six at the large table. There is a small utility room off the kitchen, which includes a washer/dryer, vacuum cleaner, mop and bucket, iron and ironing board and a clothes horse. Alternatively you could pop back in to Bakewell to pick up local produce at the farmers market (last Saturday of each month) or at the regular Monday market. We also supply discount vouchers for the Wheatsheaf pub on Bridge Street and The Scotsman’s Pack in the nearby village of Hathersage. After a day exploring the Peak District you can relax in the beautifully styled sitting room with the warmth of a real log burner creating a cosy glow. The open plan living and dining space has been decorated in relaxing neutral colours and filled with gorgeous soft furnishings and spacious sofas in modern greys and mustards - the perfect place to socialise at the end of the day. You will also find logs for the fire, a TV with freeview and a Bluetooth speaker in lounge for your required entertainment. The front of the property is on a quiet row of stone built cottages next to Bakewell Methodist Church. There is a pretty, secure patio area to the rear of the property, which provides seating and a table for two people to enjoy a relaxing glass of wine or meal in this quiet sun trap. There is also a washing line for use in the warmer weather and a coal barbecue (please supply your own coal). Please note that the next door neighbour has access rights to the rear yard in order to take his bin out. Parking for the cottage is provided nearby at a secure, flat car park 100m from the property at Brocklehurst Countryware and is rented for the property only. You may park directly outside the cottage for loading and unloading. There are four floor-mounted bike racks in the secure patio area at the rear of the property. You will pick up an envelope on arrival in Bakewell, which will contain a map of the local area with directions to the property, the property keys and a key fob for the secure car park. You will receive instructions on key collection once your booking is confirmed. We are a local couple and the cottage has been in our family for 20 years. We are Derbyshire born and bred with strong family ties to the area and have worked in the leisure, tourism and hospitality industries all of our lives. These factors have led us to develop a small portfolio of independently operated businesses in the local area, including The Old Original Bakewell Pudding Shop. We grew up locally and still live in the area and wanted to give others the opportunity to experience Bakewell and all its surroundings have to offer for themselves. Our cottage is in the heart of Bakewell, a popular market town in the Peak District National Park, surrounded by natural beauty. The cottage and area are quintessentially English - we believe there really is no better place to stay! Our cottage is traditional, stone-built and homely with an unrivaled location in the heart of the town. It is on a pretty, quiet row right next to the church and within a stone's throw of some fantastic local eateries, walks and the River Wye. We have lovingly restored the cottage so that it retains its traditional character, but boasts luxury modern features. Combined washer/dryer in the utility room. Private parking space provided at a secure, flat car park 100m away. You may park directly outside the cottage for loading/unloading. Four floor-mounted bike racks (secure patio at rear of cottage). Free WiFi is available in the property. Log burner in the living room fireplace with logs supplied. Beautifully styled open plan living room with real log burner. Decorated in relaxing neutral colours. Gorgeous soft furnishings. Logs for the fire. TV with Freeview. Bluetooth speaker. The open plan dining area seats six people around a large table. High chairs available on request. TVs with Freeview in the living room and all three bedrooms. Bluetooth speaker in the living room. iPod docking stations in the bedrooms. There are a few books and recipe books on the shelves in the living room. A couple of board games are stored on the shelves in the dining area. There is a pretty, secure patio area to the rear, with seating and a table for two for outdoor dinin. There is also a washing line and a charcoal barbecue (please supply your own coal). What a brilliant location right in the centre of Bakewell. The cottage was cosy and warm and contained everything we needed for our short break. One of the bedrooms is a bunk, which we knew, but it was a bit tighter than expected for my 6’ son! Would be a perfect night time den for younger children though. The breakfasts at The Old Original Bakewell Pudding Shop were delicious, as we expected having eaten there several times before. Nothing is too much trouble for the waiting staff. Would highly recommend this property either if you want to park up and not use your car for a few days or if you would like great access to the beautiful walking country surrounding Bakewell. Really enjoyed our stay. Cottage was lovely and great location. Had 5 days here. Bakewell is a really nice little town. The cottage was great, we had been concerned about not having parking at the cottage, but the available spaces were very close and secure. The addition of breakfast at the old pudding shop was a great addition, food was good and accommodated dietary requirements. Would be very happy to stay here again. We loved the cottage. It is lovely inside and is in a great location. For us at least, it came with great weather as well. We highly recommend it! Fantastic location with secure parking just around the corner. Lovely complimentary breakfast each morning. Only issue for us and our dog was when the arrival instructions came through there is a house rule that the dog can’t be left in the house alone but he wasn’t permitted at breakfast either. Beautifully decorated & furnished cottage in the heart of Bakewell - and lovely & cosy - particularly appreciated as we were having heating problems at home, during the coldest spell this winter. Not impressed with the quality of breakfast at the Old Original Bakewell Pudding Shop - pre-cooked items kept warm, not freshly cooked. So we only ate there once. Bakewell has all you need in restaurants (Raja's and The Manners recommended), bars & shops and the surrounding countryside is fabulous for hikers such as ourselves. Lovely little break! Fab cottage in a great location.Would definitely recommend! Beautifully decorated and looked after cottage, with a well equipped kitchen and comfy bedrooms and sitting area. The accommodation is very clean and modern inside, and to get such a great choice of breakfast included is a fab touch and was very much enjoyed by us all! No. 1 Chapel Row is in the heart of Bakewell, one of the most popular historic market towns in the Peak District National Park. You are a just a minute’s stroll from the town centre, which is well served with amenities such as pubs, cafes, gift shops, a museum and more. You are just a short drive or bus ride away from Chatsworth House (10 minutes), Haddon Hall (10 minutes) and the historic spa town of Buxton (20 minutes) - breathtaking places to explore right on the doorstep. Alternatively, head off on foot (or two wheels) to take in the scenic views and dramatic landscape offered by the Peak District - the UK’s first national park, designated in 1951. The nearby Monsal Dale is an excellent example of the Derbyshire countryside, with opportunities to stroll along the meandering riverbank, enjoy a picnic or hire a bike. Monsal Head, directly above Monsal Dale, is one of the most famous and photographed viewpoints in Derbyshire. Alternatively embark on a walk from the doorstep through Lathkil Dale; head for nearby Baslow and follow an old coach road to Curbar Gap; climb gently via village roads and field paths to Little and Great Longstone or simply stroll around the undulating acres of the Chatsworth Estate and keep an eye out for the deer and sheep roaming free. The possibilities are endless.